Defending champions Hill Crest B won the Sowerby Bridge Association’s Four-Man Team Knock-out competition at Sowerby T & BC on Sunday. They beat Mytholmroyd B by 81-62 to retain the Malcolm Edmondson Memorial Trophy. Hill Crest were conceding 13 start to their semi-final opponents Luddenden Foot A but had reduced the gap to eight after the first two games. Martin Murphy’s 21-13 win against Craig Elwin gave them a good start but Ben Halliday hit back for Luddenden Foot with a 21-18 victory over Lyndon Harris. Scott Haynes’s 21-11 result against John Halliday and Michael Holmes’s 21-9 victory over David McMahon ensured a comfortable 84-70 victory for Hill Crest. Mytholmroyd’s semi-final against Ripponden B was a much tighter contest. Ripponden had five start but Mark Jeffreys soon put Mytholmroyd ahead, racing to a 15-5 lead against Jason Leeming before winning by 21-13. 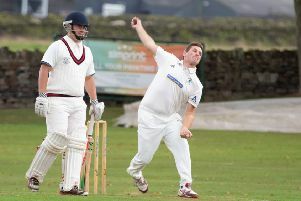 David Holder responded with a 21-14 victory over Roy Nicholson to restore Ripponden’s advantage. David Warburton’s 21-8 success against Barry Nellis swung the game decisively in Mytholmroyd’s favour and Darren Metcalfe’s 13 chalks against Brian Winrow was just enough to see Mytholmroyd home by the narrowest of margins, 78-77. Mytholmroyd had six start in the final but this was soon wiped out as Scott Haynes swept to a 21-4 victory over Roy Nicholson. Michael Holmes added to Hill Crest’s total, finishing with a break of 12 to run out to a 21-13 victory over Mark Jeffreys. The remaining two games finished at the same time with the same score, each side winning one of them. David Warburton had a consolation victory for Mytholmroyd with his 21-15 success against Martin Murphy while Lyndon Harris rounded off a successful afternoon for Hill Crest, winning by the same score against Darren Metcalfe. Semi-final scores - Luddenden Foot A (16) v Hill Crest B (3): B.Halliday 21 L.Harris 18, C.Elwin 13 M.Murphy 21, J.Halliday 11 S.Haynes 21, D.McMahon 9 M.Holmes 21. Ripponden B (14) v Mytholmroyd B: J.Leeming 13 M.Jeffreys 21, D.Holder 21 R.Nicholson 14, B.Nellis 8 D. Warburton 21, B.Winrow 21 D.Metcalfe 13. Final - Hill Crest v Mytholmroyd: M.Holmes 21 M.Jeffreys 13, S.Haynes 21 R.Nicholson 4, M.Murphy 15 D.Warburton 21, L.Harris 21 D.Mecalfe 15.